16th and 20th Worcester share Science Spectacular! Joint Colony Meeting for an exciting evening of Science! End of term ice skating party!!! 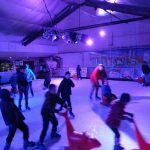 20th Worcester had a terrific time at the Malvern Ice Rink on Friday night. It's not often that we manage to get the whole group together, but we managed it for Ice Skating. It was great to see all the older children helping their Beaver group mates get up and skating!